Virtual reality device Oculus Rift is finally releasing early next year, and at their first ever E3 press conference, the company announced the initial slate of games. The most noteworthy announcement came from Insomniac Games, who are producing an Oculus-exclusive game called Edge of Nowhere. 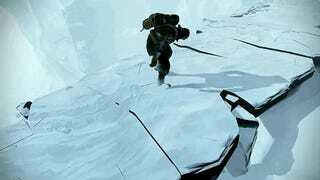 It’s third-person, set in some kind of ice world, and has lots of ugly monsters chasing you around. Gunfire Games showed off a dungeon crawler called Chronos. CCP showed up with a new trailer for EVE: Valkyrie, though the new video is not online yet. This first-person hockey game, part of a sports collection, looks pretty cool? Harmonix, High Voltage, Square Enix, Playful, Climax, Coatsink, Gunfire Games, CCP, Glu, Ozwe, and Carbon Games are among the developers who pledged to develop games for Oculus today. We should have a full list of games soon, as the press conference just concluded.